Successfully Added Skype to Phone Adapter - VoIP to Landline Phone Adapter to your Shopping Cart. 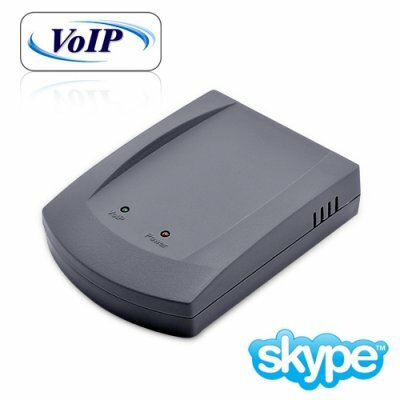 Skype to Phone Adapter that lets you make and receive VoIP calls right on your landline phone! This Skype to landline phone adapter is an amazing little device that lets you consolidate all your VoIP phone calls into your landline phone. When you receive a Skype In call, your landline phone rings. When you want to dial a Skype Out call, you can dial either on your computer screen or on the phone itself. If you receive a landline call while you're making a Skype call, you can put your Skype call on hold and switch to the landline call. For greatest convenience, use this VoIP adapter with a cordless phone to make and receive Skype calls from anywhere in your home or office. Setting up and using this Skype to phone adapter is easy and intuitive too. Just connect this device to your phone line, your landline phone, and your computer, then install the included software. That's it! You can now receive and make VoIP calls with Skype and other low-cost VoIP programs on your landline phone. This VoIP to phone adapter also comes with presets that let it integrate seamlessly with a number of low-cost or free VoIP services, such as Skype, VoipBuster, VoipStunt, and many more. Pick up this amazing VoIP to landline adapter to give your home or small office an added level of convenience and greater cost-savings. Take advantage of our super-low prices to get one today, or order in bulk for even greater savings to beat your competitors on eBay. This great product is available with a no MOQ (minimum order quantity) for a limited time only. After 60 days, it will only be available with an MOQ of 3 units, so be sure to order your samples right away! This product was previously listed as Skype VoIP USB to Landline (2-in-1) SkypeDECT Hub. This is the updated version of our popular Skype to landline adapter. Included software and detailed user manual make using this device quick and easy. Just dial * # * on your phone to switch between VoIP and landline calls.